Miss Kayne’s proud boast to Detective-Sergeant Bobby Owen is that she has committed the Perfect Murder – a crime with no clues. Bobby thinks at first it is a macabre joke, but before long a body is reportedly found, stabbed in the world-famous Kayne Library. When Bobby gets to the scene, the corpse has disappeared. But instead Miss Kayne’s cousin, Nat, is found in a nearby country lane – shot through the heart. Were the two murders connected – or were there even two? Bobby finds himself embroiled in one of the most ingenious and sinister cases of his career. Can he prove this was not a case of Perfect Murder? 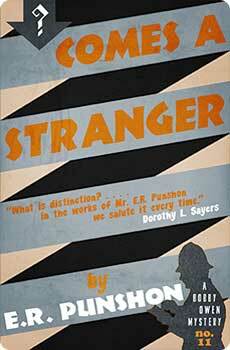 Comes a Stranger, originally published in 1938, is the eleventh novel in the Bobby Owen mystery series. This new edition features an introduction by crime fiction historian Curtis Evans.